Preheat oven to 325°F. Butter and flour a 12-cup bundt pan. Using an electric mixer, beat 1 1/4 cups butter in large bowl until smooth. Gradually add sugar, beating until fluffy. Beat in eggs 1 at a time, then orange juice, orange peel and vanilla. Add flour and salt and beat just until blended. Transfer batter to prepared pan. Bake cake in preheated 325°F oven until golden and tester inserted near center comes out clean, about 1 hour 5 minutes. Cool cake in pan on rack 10 minutes. Invert cake onto rack and cool completely. Measure sugar and take out 1 tbsp. regular sugar and replace with 1 tbsp. vanilla-sugar. Stir sugar, orange juice and grated orange zest together in a small, heavy saucepan. Bring to a boil and stir constantly for about 6 minutes until thick and syrupy. There should be about half as much liquid as when you started, and the glaze will look thick once most of the orange juice has cooked off. Remove glaze from heat, set aside. 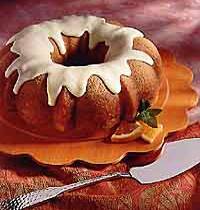 Place pound cake onto a serving plate and drizzle with glaze. I like to figure out how many pieces the cake will be cut into, then drizzle thick stripes of glaze over the cake, so each piece will have a line of glaze down the middle. Let cool completely, cut and serve. Note: Cake can be made 1 day ahead. Wrap in plastic wrap or aluminum foil and store at room temperature.